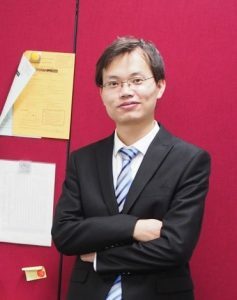 Congratulations to Shitao Wang for being named an Associate Professor at the Beijing University of Chemical Technology! Below is a Q&A with Associate Professor Wang. –What is your new title and when will you start your professorship? My new position is the Associate Professor in the Beijing University of Chemical Technology, China. And I would like to start my professorship in October. -Tell me more about your background and where you received previous education. I obtained my bachelor’s degree at Zhengzhou University (2010) in polymer science and engineering, and master’s degree in 2013 in organic chemistry (research filed: organic optoelectronic material science) at Shanghai Institute of Organic Chemistry, Chinese Academy of Sciences. After that, I joined professor Makoto Fujita’s lab at the University of Tokyo, Japan and obtained my Ph.D. degree in applied chemistry in 2016. During my Ph.D. study, most of my work was about the metal-organic ligand coordinated self-assembly in supramolecular chemistry and the host-guest chemistry. -Why did you decide to do research in the Percec Group? I decided to do research in the Percec group to broaden my research experience and to learn something different from my previous work. And also professor Percec is very famous for the self-assembly in the bulk state. His group developed the unique methodology to analyze the self-assembled structure in solid states, which is totally different from my Ph.D. study where most self-assembly was conducted in the solution state. -What have you learned during your time in the Percec Group? I have learned a lot after one year of study in Percec’s group such as how to synthesize Percec’s type dendrimers, how to analyze the self-assembled structures in the solid state, and much about xrd analysis. -What are your research goals after leaving the Percec group? How has your time in the Percec group molded your future aspirations? After leaving this group, I would like to put my research interest in material science. Hopefully, I can combine the chemistry and material science in my research and focus on their application. My unforgettable experience in this group inspired me that we should do our own unique research and should not always follow others’. -Do you have any advice for aspiring professors or researchers? To do scientific research, we should work hard, think hard, and be patient and strict with our experiments. To be the group leader, we should know how to make everyone involved in the project to be more efficient and make the project progress well. Finally, cooperation in scientific research is also very important.